SKF NOTE: I still enjoy looking at drum advertisements. Not all of them. But especially pre-internet ads. Short of seeing drummers live at clinics (rare), or in concert (rarer for minor age drummers), or on t.v. (rare) – photos in magazine drum ads provided hours of study when I was growing up. 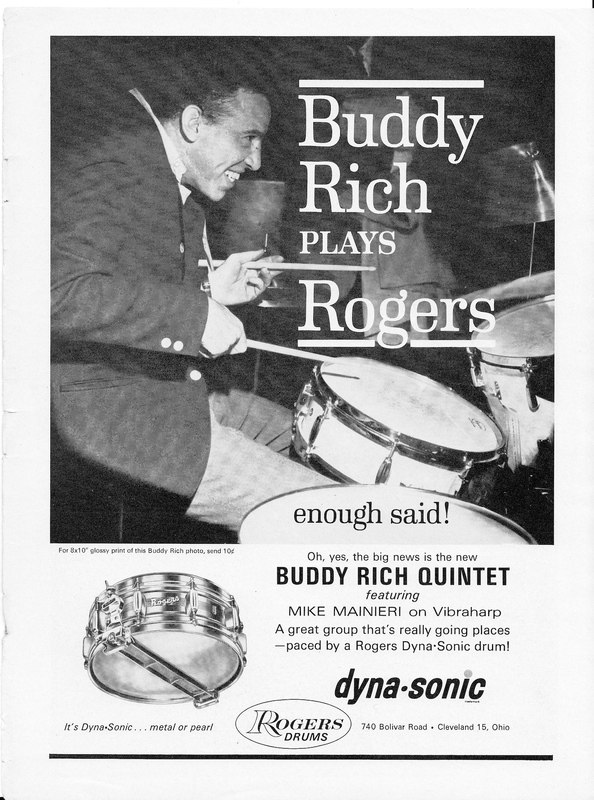 Like this Buddy Rich ad for Rogers Drums. What a great still shot of how Buddy holds sticks and his hands. I guarantee many drummers tried tilting their snare drums after seeing this ad. And as I was looking at this ad a day or two ago, I noticed the flattened cardboard box wedged between Buddy’s snare rim and the side of his small tom-tom. Plus, even as stand alone photos, many of these old drum ads – done by great photographers such as Chuck Stewart – are priceless. Yes, a picture is still worth a thousand words. This entry was posted in SKF Blog and tagged Buddy Rich, Chuck Stewart, Drummer, photography, Rogers, Scott K Fish. Bookmark the permalink.